Anuradha is an Austin icon whose impact on the local arts and culture is now expanding on the global scene. The Austin Chronicle included her in their list of Movers and Shakers for her body of work and contributions to the local dance scene. Mayor Adler acknowledged Anuradha for her 25 years of work in the Austin community with Austin Dance India. Her ability to straddle effortlessly between ancient Indian dance to Texas folk music to global development projects makes Anuradha a sought after speaker, performer, and collaborator. Raised by art-loving Indian parents in Canada, Anuradha has the best of many worlds. Her western upbringing along with her traditional training in India and deep-rooted spirituality make her a unique teacher and performer who connects with people from across the globe. She relates easily to both ancient and contemporary cultural and artistic traditions and has been performing worldwide for over 30 years. She is a 2018 inductee into the Austin Arts Hall of Fame for her contributions to the dance field. In 1989 she was awarded the prestigious Jacqueline LeMieux Prize by the Canada Council, making her the only Indian classical dancer to receive this high honor. She was bestowed the title of Sringar Mani, “Artistic Jewel”, in Bombay after her performance at the Kal-Ke-Kalakaar Festival in 1990. With an Honors BA in Philosophy and a Master of Fine Arts in Dance Ethnology, Anuradha combines artistry with scholarship. Numerous study grants and honors have allowed her to continue research and study of ancient Sanskrit texts. She received several grants from the Canada Council as well as the Shastri Indo-Canadian Institute. She has taught at numerous colleges and universities in Central Texas including University of Texas at Austin, St. Edward’s, Southwestern, and Austin Community College. Her expertise has been utilized on many juries including the Texas Commission on the Arts Young Masters Program and the Canada Council as well as community and college organizations. PBS show "Lift the Heart"
Anuradha has been actively involved in teaching youth in many capacities. In Canada she participated in artist-in-residence teaching programs, workshops, and lecture-demonstrations in public schools. With funding from the City of Austin Cultural Contracts, the Texas Commission on the Arts, and the National Endowment for the Arts, she presents assembly performances on Indian dance and culture in Austin area schools. 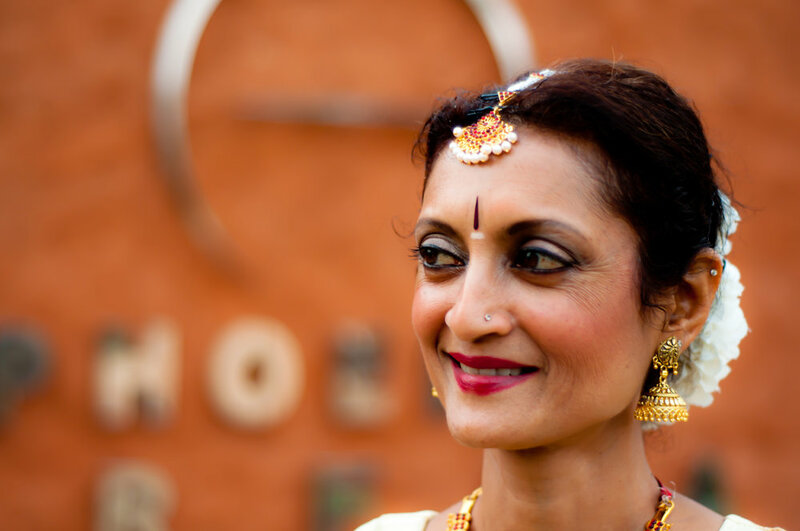 She is Artistic Director of Austin Dance India, an organization she established in 1989 to teach Bharata Natyam technique in small classes led by herself rather than a large academy. Behind this decision is her dedication to utilizing the art to empower students by establishing a strong personal relationship with each student. Anuradha is an active performer and collaborator in Austin today and also continues to renew her ties with the Canadian dance scene. She is a juried artist on the touring roster of the Texas Commission on the Arts and Mid-America Arts Alliance. Anuradha has been nominated multiple times and has been the recipient of the Austin Area Critics’ Circle Award for Best Dancer. In 2011, her production, Parampara, won the Best Dance Concert Award from the Critics’ Circle. 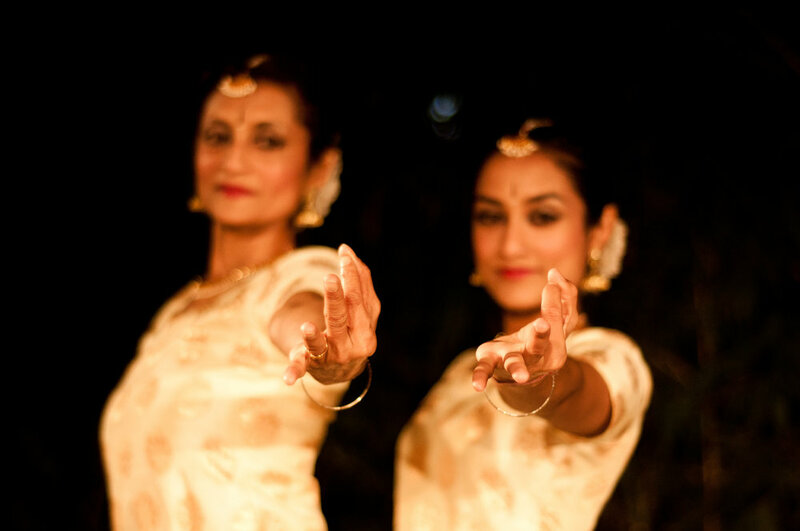 In 2013, Two Generations, One Tradition, mother-daughter collaboration with dancer daughter, Purna, was nominated for the Best Dance Duet Award. In 2014, her collaborative performance with touring artists from India, Jewels of the Tanjore Tradition, was nominated again for Best Duet. 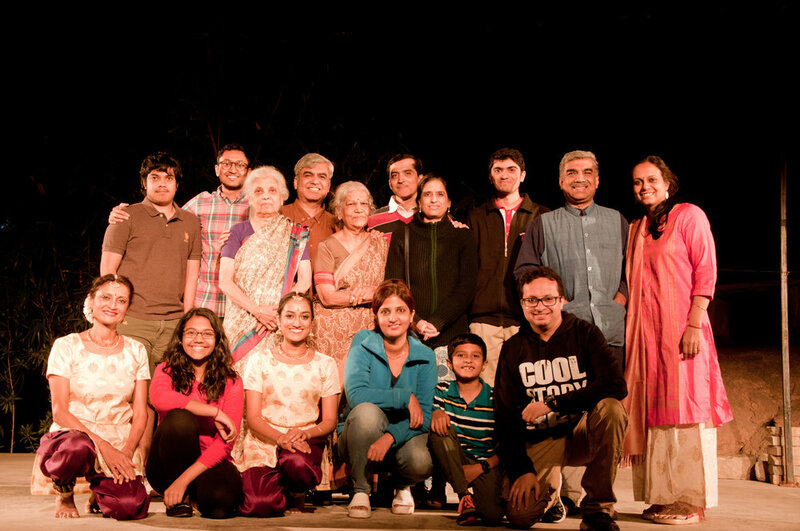 Passionate about creating and performing works that not only historically preserve artistic traditions, but also reflect the current times, in March 2016 Anuradha co-produced and performed in Living on the Hyphen, a full-length original theatrical production at The Long Center in Austin, featuring a diverse cast relating stories of race, ethnicity, social perception, and personal identity. As a celebration of her 25th anniversary season, she presented Girl Power! with fifty-four of her students at The Long Center. This production brought attention to the UN Sustainable Development Goals and in particular, the goals of Gender Equality and Quality Education. From this show her solo, Fearless, was selected and she presented it in NYC in March 2017 during the MODArts Collective Festival featuring women choreographers of color. She has been a regular guest artist in Tapestry Dance Company’s productions for the past 15 years including Esprit, Footprints, and most recently, Passing It Forward. Along with her Austin area artistic projects, Anuradha also tours worldwide regularly. She completed a solo performance tour of India that included the historic temple site at Tanjavur under the auspices of the Brihan Natyanjali Cultural Foundation Trust. She conducted a successful historic tour with 18 of her students from Austin, during which they performed at seven historical temples in southern India. During this tour, she traveled as an official Cultural Ambassador for the City of Austin. While there, she was honored with the Maha Mayura Nritya Award at Mayiladuthurai, Tamil Nadu in December 2014 and the International Nritya Shiromani Award by the International Nriyotsav of Govt of Odisha, India in January 2015. In addition to her dance pursuits, Anuradha has undergone teacher training in yoga, which she incorporates into her dance classes. She has developed her own dance pedagogy while teaching Bharata Natyam dance that deconstructs the movement into the place of origin in the body. Anuradha has also traveled to India to film two documentary projects, Living Stone: Brought to Life by the Hands of Time and Hasta Mudra: From the Hands of Gods. She is a Fellow of Artist INC, through which is a trained facilitator for artists seeking information and guidance on refining their art career. Anuradha is a member of the Artists Twenty Thirty Network, a consortium of artists worldwide who engage in social practice affiliated with the UN Sustainable Development Goals. Her passion for girls’ empowerment has led to an approach that utilizes dance to help young women discover their strengths. She is the recipient of the 2017 Artistic Innovations Grant from the Mid-America Arts Alliance for a community-based project, Dance for Global Goals. Most recently in October 2017, her work is featured on the Lonestar Emmy-award winning KLRU series Arts in Context episode, Lift the Heart. This series aired on national PBS stations across the United States. Along with performing and teaching, Anuradha is passionate about arts in education. Her presentations are well received because she is able to connect with youth and demonstrate the inherent universality and relevance of art. For over 30 years she has conducted assembly performances, lecture-demonstrations, workshops, and master classes on Indian dance and culture in public schools, universities, museums, and libraries. She is a selected artist with the Texas Commission on the Arts and Mid-America Arts Alliance. She teaches classes and directs diverse cultural projects through her organization, Austin Dance India, which celebrated its 25th anniversary in 2016. Her popular interactive educational program, Moving Myths of India, features storytelling from Indian mythology, clapping of rhythms, miming of hand symbols, and more. Touching upon interesting facts, Anuradha weaves cultural aesthetic values into this educational and entertaining program that has been performed for well over 75,000 youth within Texas and beyond. Anuradha has been a primary resource and leader for the City of Austin, Texas Tech University, University of Texas at Austin, Austin Independent School District, and other institutions in promoting cultural awareness, artistic diversity, creative entrepreneurship. She sits on several panels and committees that provide mentoring and consultation for various groups within the creative sector. Anuradha’s passion for using art to promote girls’ empowerment and sustainable development has naturally led her work into the realm of Social Practice. She has received grants to implement projects in her local community which promote and inspire social change. These experiences have sparked a keen interest in working with girls globally with mentoring projects.